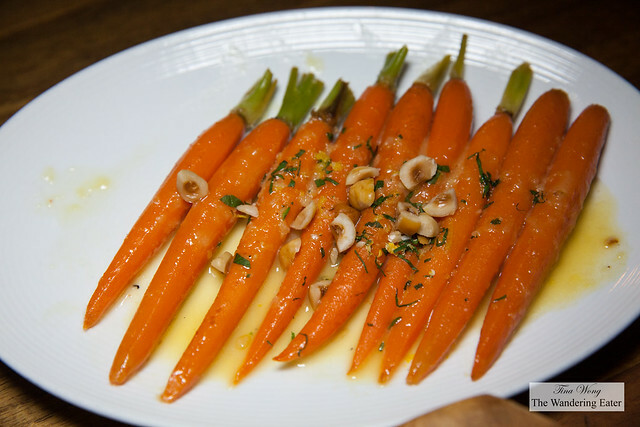 TESSA in the Upper West Side is a Mediterranean inspired restaurant that is a solid choice to dine in the neighborhood. 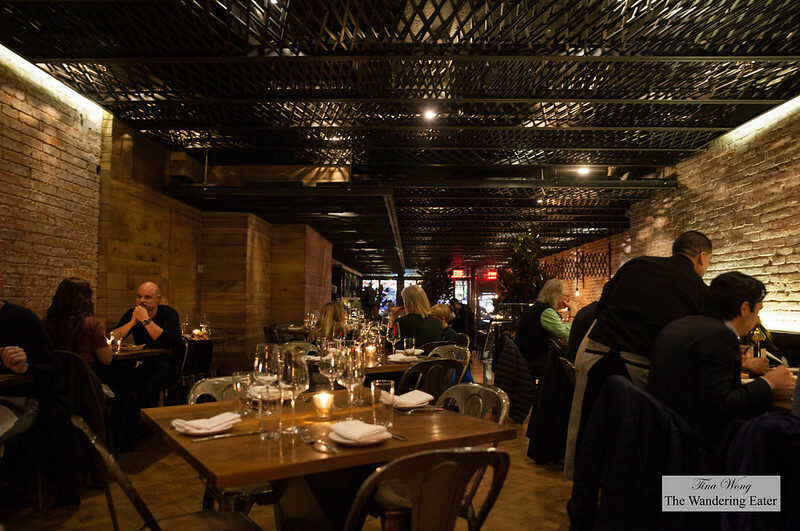 Usually when you think of the Upper West Side, you don’t normally think of dining destinations kind of place but there are very great places to shop for food or specialize in a certain dish (e.g. Zabar’s and Barney Greengrass). When we entered the restaurant, there’s exposed white-washed brick walls with the black steel gates on the ceiling that gives it an industrial yet rustic look and a long and deep bar. We were escorted to the main dining area toward the back half of the restaurant and it’s a pretty bustling place given we were there on a Tuesday night. We started off with their cocktails of 347 and Love Me Frida. 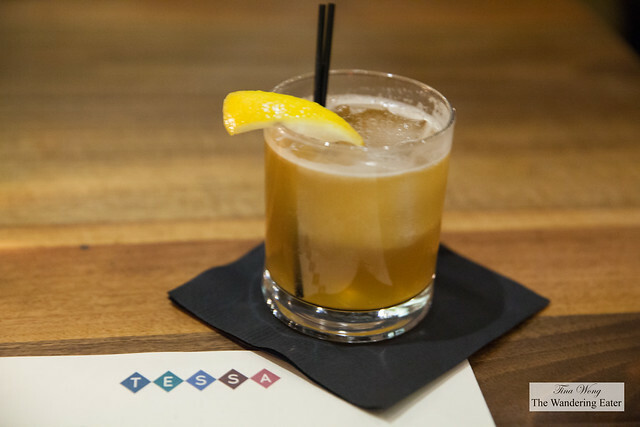 The 347 is a mixture of Old Granddad Bourbon, Zucca Amaro, honey, fresh lemon, and finished with ginger beer that tastes better after the ice melts for a few minutes. The bourbon and Amaro balanced out a bit better for the chill and dilution, in my opinion but it’s a lovely spicy, gingery drink. My friend’s Love Me Frida is an unexpectedly good cocktail of Espolon Tequila, Domaine de Canton ginger liqueur, lime, and Concord grape purée. 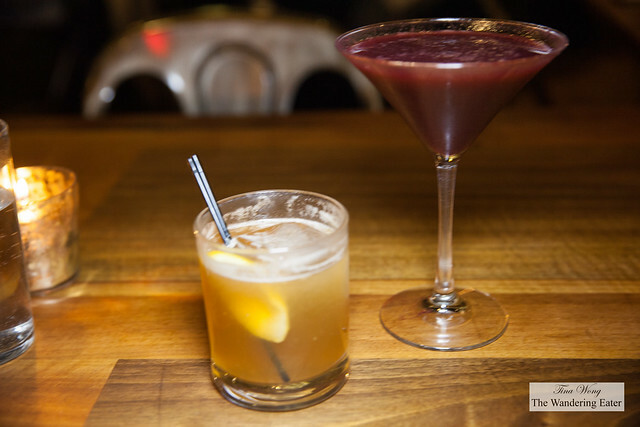 It has a delicately floral sweetness from the grapes but tempered by the tequila. 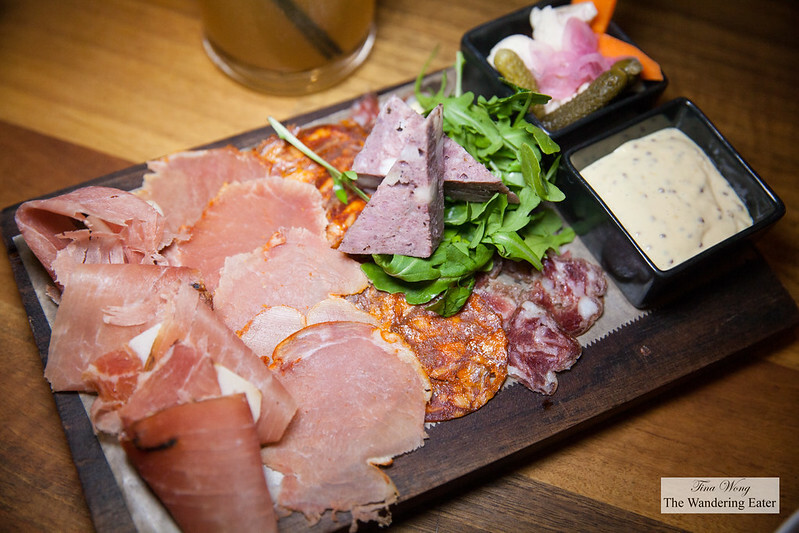 The salumi board we had was probably the best charcuterie/salumi board in NYC in recent memory. The rabbit pate was the best part of the whole board but the Iberico chorizo, Iberico salami, Italian speck and lean Iberico lomo were very tasty. The best part that there weren’t too many unnecessary condiments and bread to get in the way of the delicious meats. 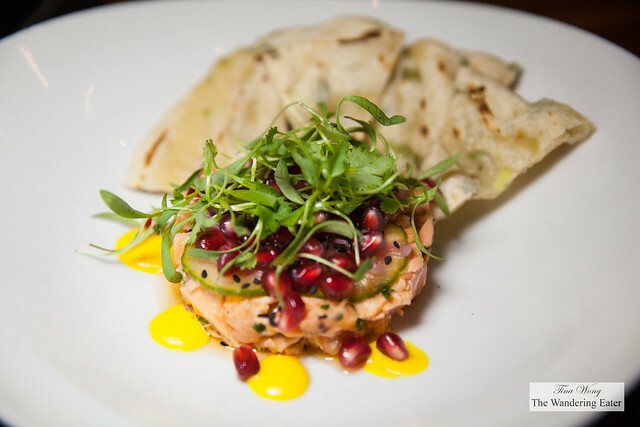 When we read the menu and saw flaked salmon tartare, we don’t understand that notion of salmon tartare having a flaky texture since tartare is a raw meat or fish dish mixed with herbs and other additions to flavor and enhance the protein. When we asked our waiter and he said it was a raw salmon dish but when we were presented with it, it is definitely cooked since the salmon meat is an opaque light pink. Disregarding the misnomer, the dish was tasty with the nutty black sesame seeds and bursts of sweet and tart from the pomegranate arils. We didn’t care much of the scallion pancakes on the side as it was limp and the flavors didn’t really work together. After we’ve finished our salmon dish, we have asked our waiter to double check with the kitchen to see if the salmon if it was cooked and it was indeed poached. The best dishes we had that evening were the plates of pastas. 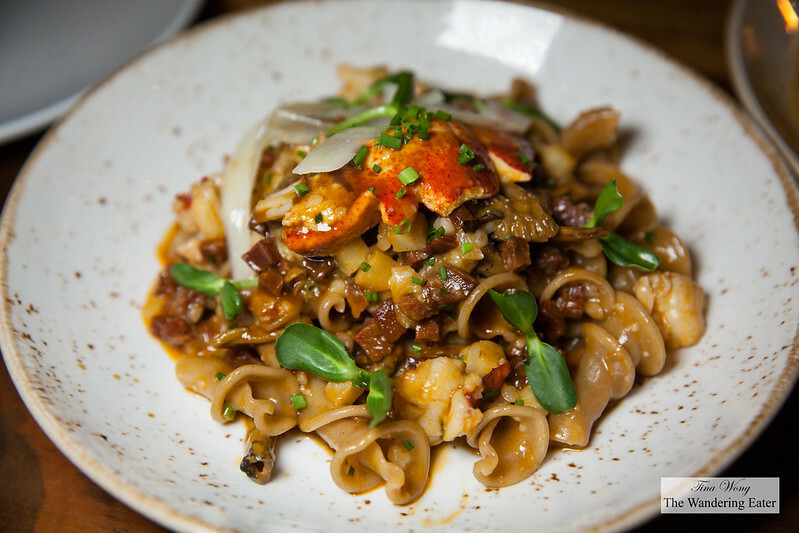 The lobster rye trumpet pasta with chanterelles, diced celery root, chorizo and beurre blanc was very tasty but the robust flavors of chorizo and mushrooms taken over the delicate sweet flavors of the lobster. 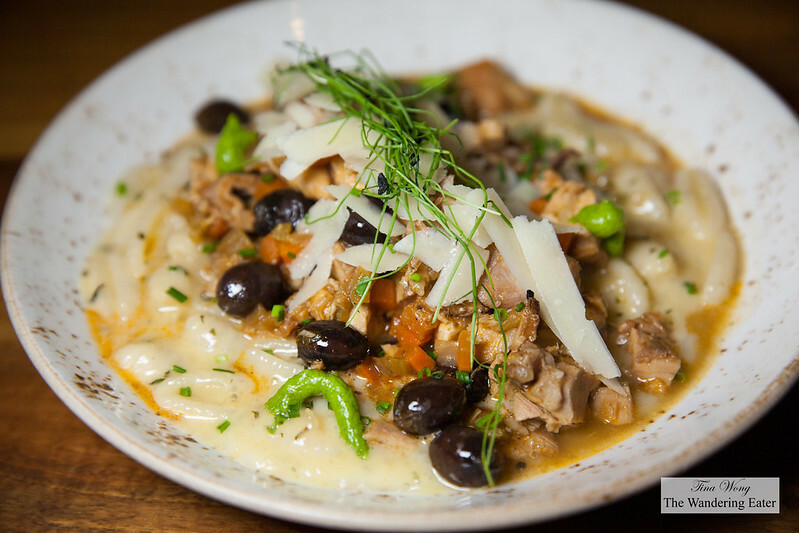 The rabbit cavatelli was a thing of beauty. The shallow bowl of perfectly cooked cavatelli pasta in a broth-like texture of rabbit & pancetta ragu and marjoram was delicious and well balanced flavors. The addition of not too briny black olives made the forkful of pasta so much better. 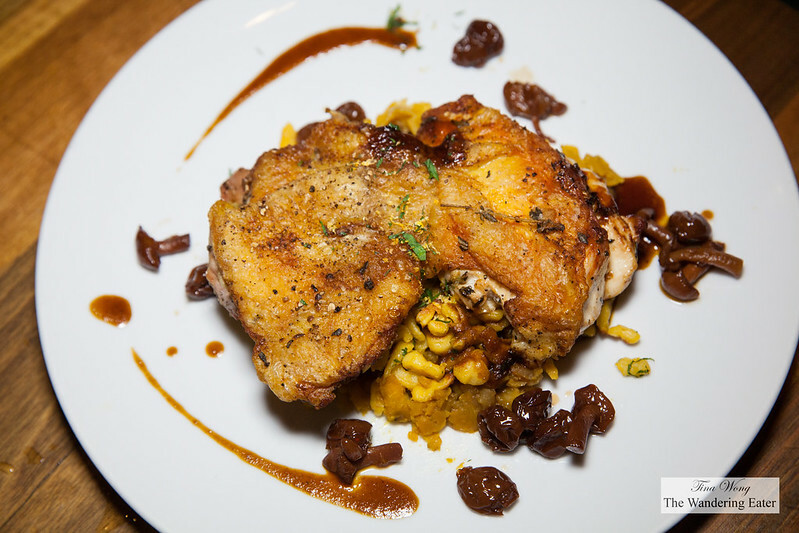 Onto the main courses of meat, the Sasso chicken cooked under a brick was a delicious and moist boneless whole chicken breasts with a nice golden brown skin. I personally did not care so much of the very sweet mixture of spaetzle, beech mushrooms, kabocha squash, dried cherry, and apple that was under the chicken. If they were separate dishes, I would appreciate it more than together. We were warned by our waiter that the 32oz Côte de Boeuf for Two will take about an hour to cook and we were fine with that since we had a whole bunch of other dishes to eat prior to. 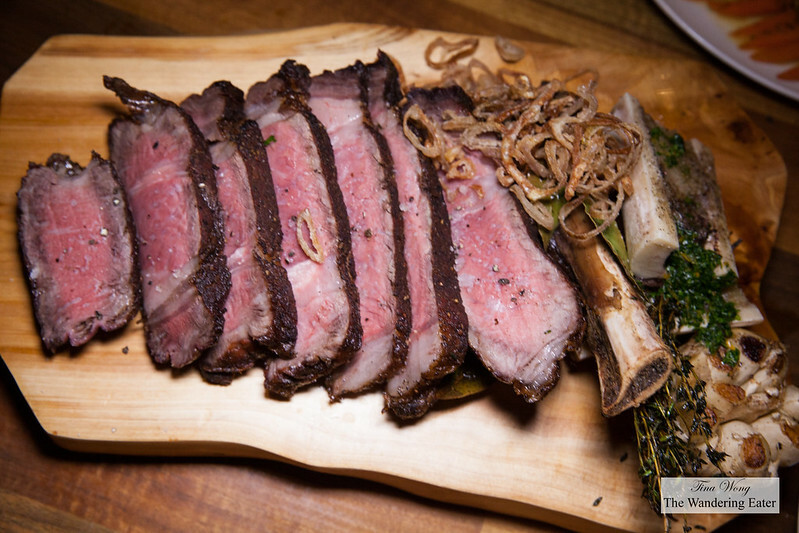 This beast of beef was served in a wooden board, topped with roast bone marrow and fried shallots. It’s sliced and cooked to the medium side of medium-rare (I prefer my steaks on the rare side). 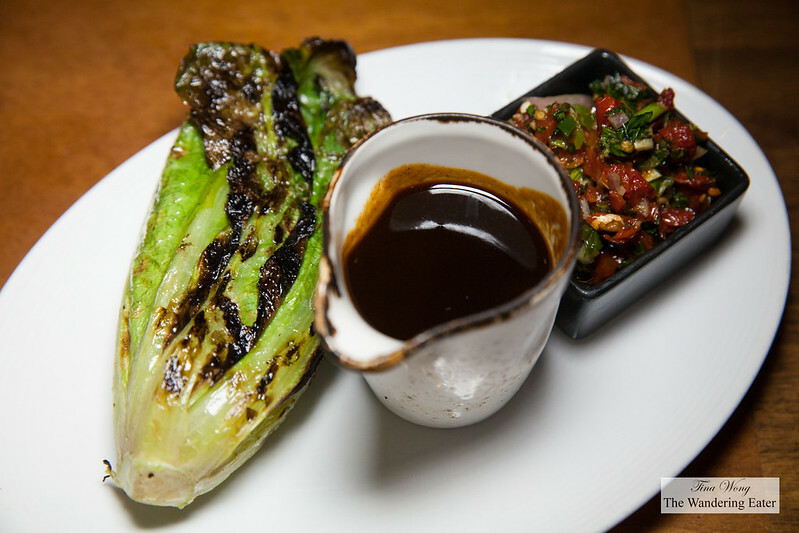 It’s still a very good slab of steak since it’s still juicy and it came with a few condiments to mix and match to our tastes like beef jus and a zesty, slightly sweet, red bell pepper take on chimichurri. The vegetable sides we selected (that came with the beef) were glazed baby carrots, shaved brussels sprouts and roast squash. The carrots were lovely and not too sweet with the raw honey and gremolata. 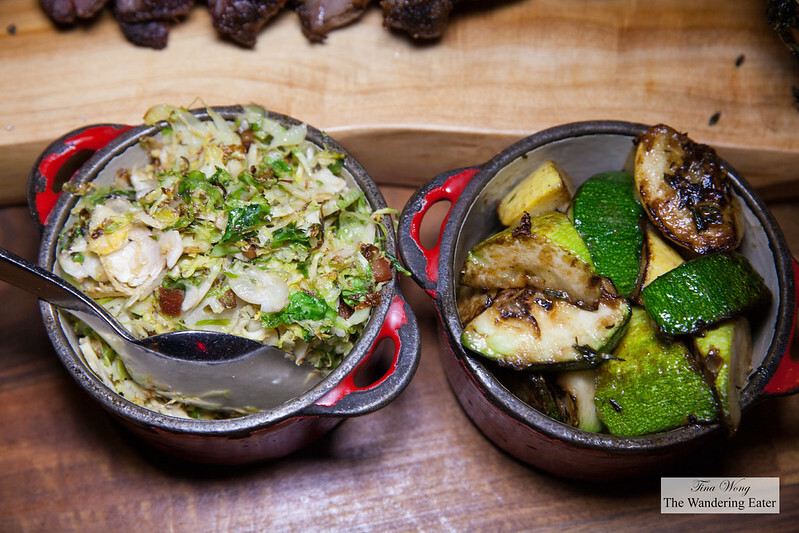 The shaved brussels sprouts were sauteed with pancetta and onions but it lacked the potentially potent flavors but it was a green to balance out our intense intake of meat. The roast squash was actually zucchini and it was very tasty with the simple use of garlic and a touch of herbs. To round out our meal, we had desserts. 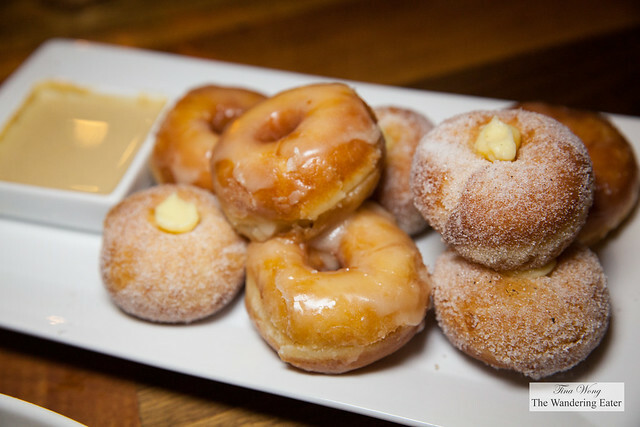 The generous plate of mini bomboloni filled with vanilla custard and mini glazed doughnuts were delicious. It felt unnecessary to dip in the hazelnut anglaise since the fresh doughnuts were flavorful already. 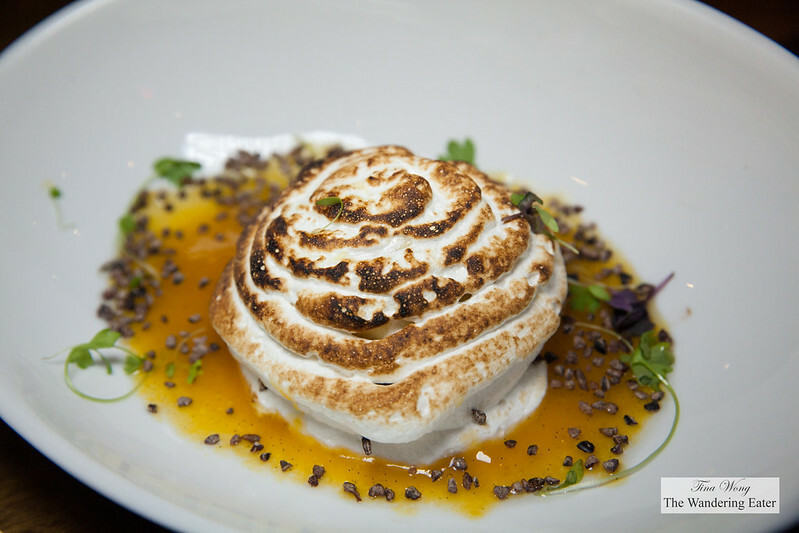 The baked Alaska was a fine take on the classic. It’s a dense brownie layered with vanilla hazelnut crunch ice cream, chocolate ice cream and torched meringue on a pool of passion fruit puree. Since I’m curious about their housemade sorbets, I had a scoop of pineapple mint and blood orange sorbets. 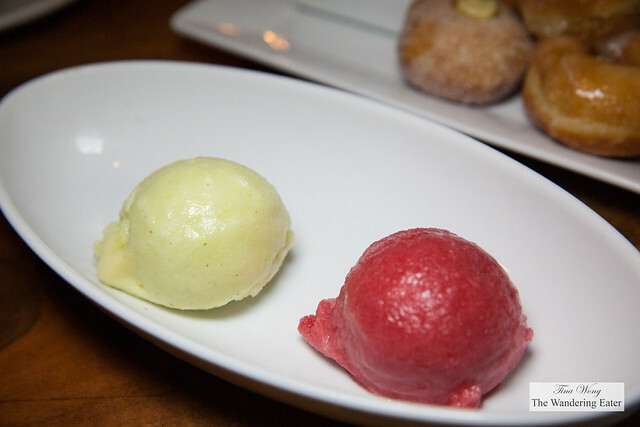 The texture on both of these sorbets were good but flavor-wise the pineapple mint was markedly better. Overall, we enjoyed our meal. The food was solid especially the pasta and salumi board. The service was attentive and friendly and we had a good time.